WHYTROPHY: I was introduced to this the name through my friend who gave me the gift of a white trophy commemorating the founding of my own company. 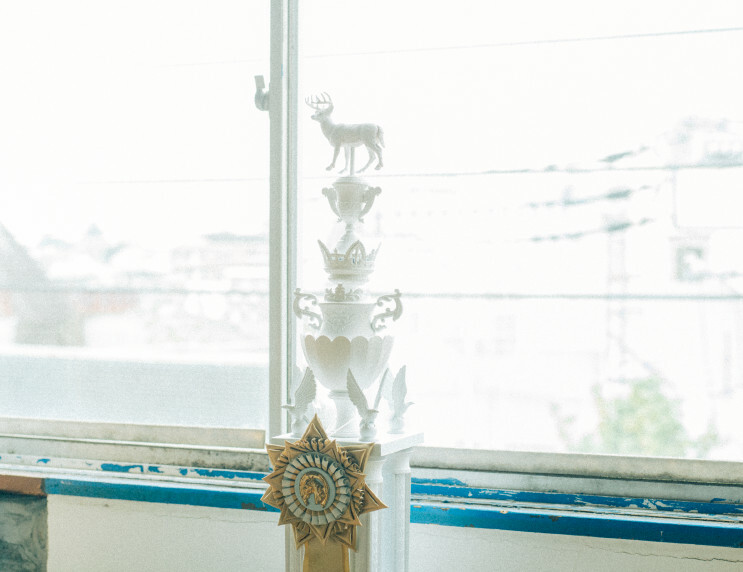 There was an elegant pale-green rosette at the center of that trophy that made an impression on me. The last time I could remember receiving a trophy was after my team won a soccer tournament in elementary school, so I was somewhat embarrassed, but now every time I look at the trophy in my office it brings me joy and makes me feel proud. 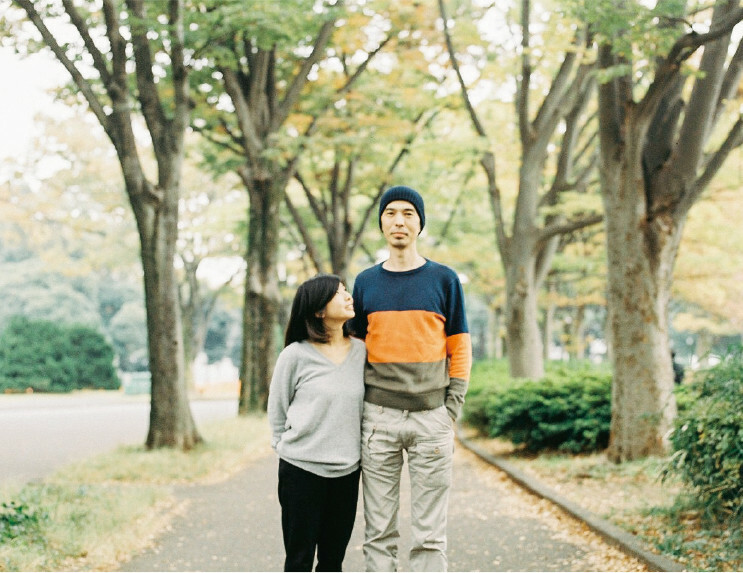 A 10-minute walk from Komazawa Park, we started our exploration in a quirky apartment built in the year of the Tokyo Olympics, 1964. This is the space that Keisuke and Mizuho spend their day. 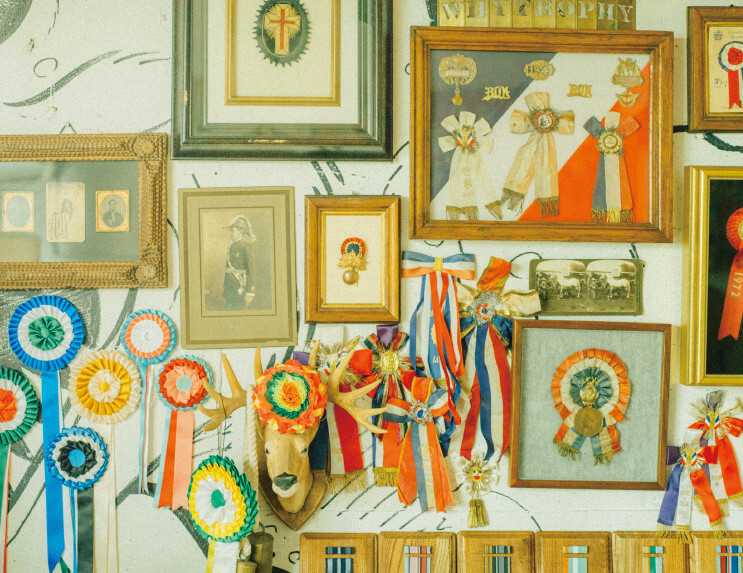 The walls are covered with rosettes small and large from their travels abroad. 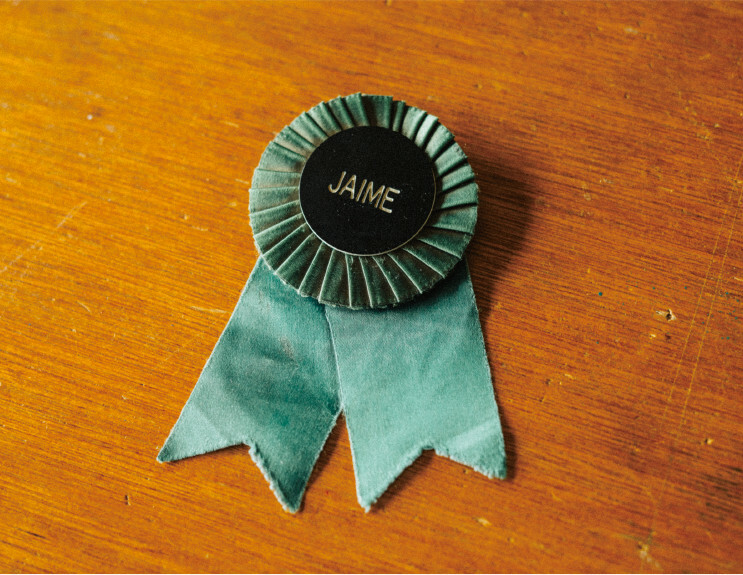 Rosettes are badge-like emblems that are typically given to someone when they win an award. They have a circular center part often times made of pleat and a button with a tail made of ribbon. Stepping up to get a closer look at them, we could see that some were cheaply made with a printed photo at the center, while some seemed to have lasted centuries, and others seemed to be knitted by grandma while she sat on her favorite knitting couch. We were surprised at the variety in shapes, colors and materials. 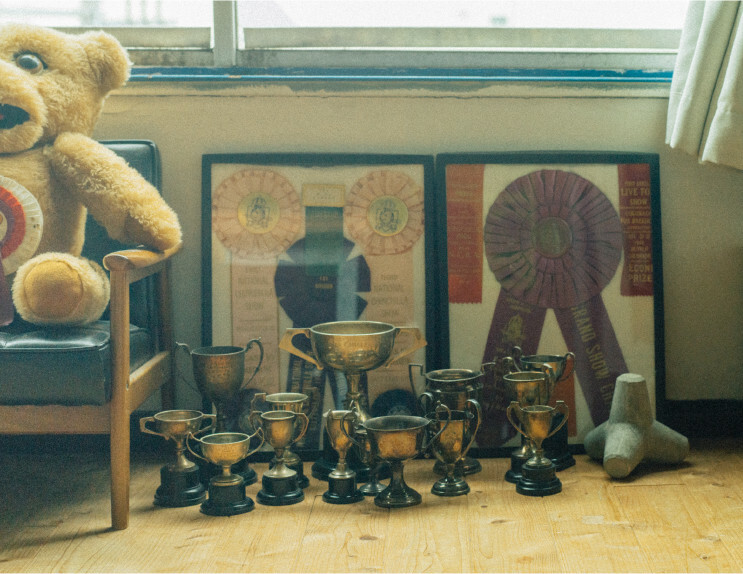 By the window silently sat the same white trophy given as a gift. So how did Keisuke, who was a writer and editor for a magazine, and Mizuho, who was taking maternal leave when they started making rosettes for WHYTROPHY, become interested in ‘praising others’ as the theme of their work? We sat down with the pair of them, their story unraveling as these questions floated to the surface. 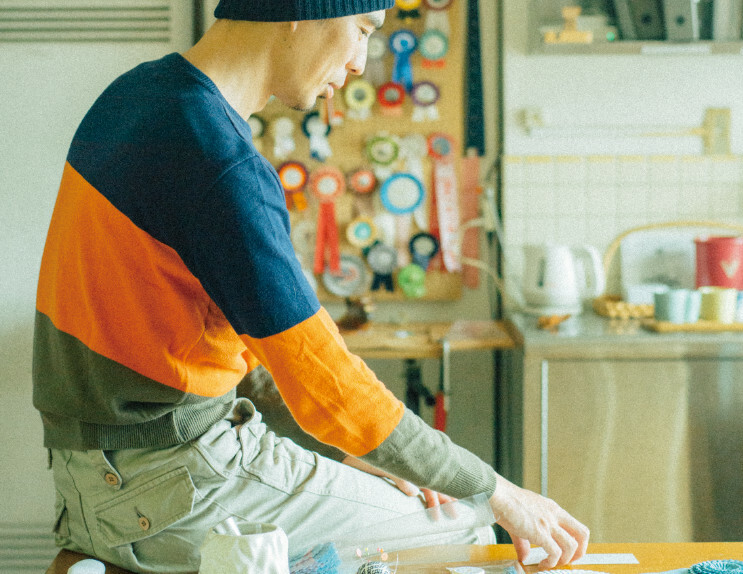 Keisuke: I was working as a writer for a culture and fashion magazine while also working in production making films and commercials for a production company. At the time I used to give friends trophies as a gift on their birthdays or for big celebrations. 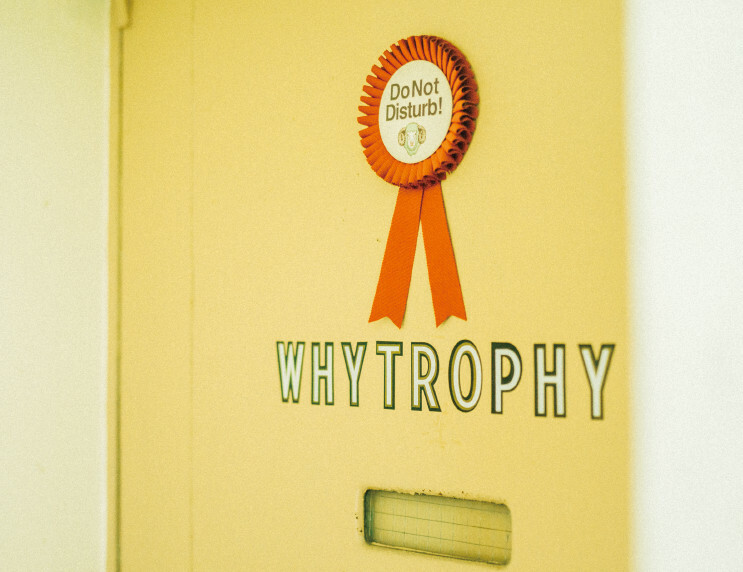 Then as I started exploring options for ribbons to add to trophies, I discovered rosettes, and my wife and I started our efforts as WHYTROPHY. 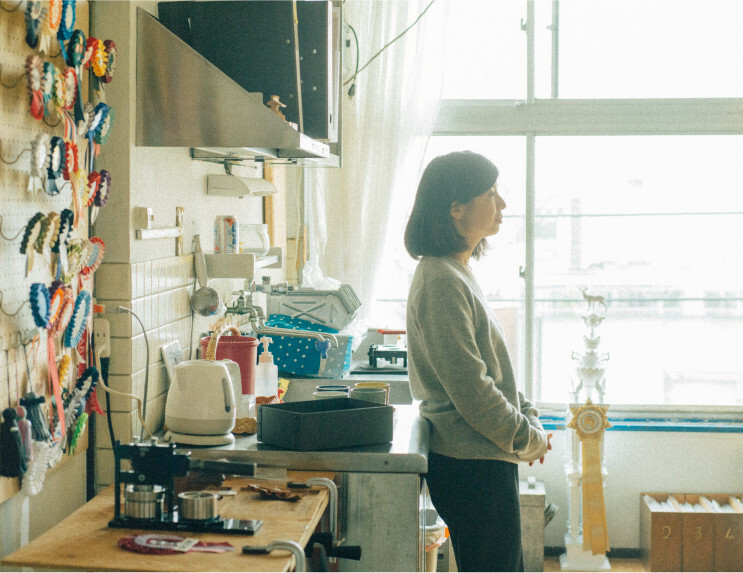 Mizuho: After I studied fashion and accessory making in Osaka, I worked a retail job in Tokyo. I met my husband, we got married and I quit my job during my pregnancy. 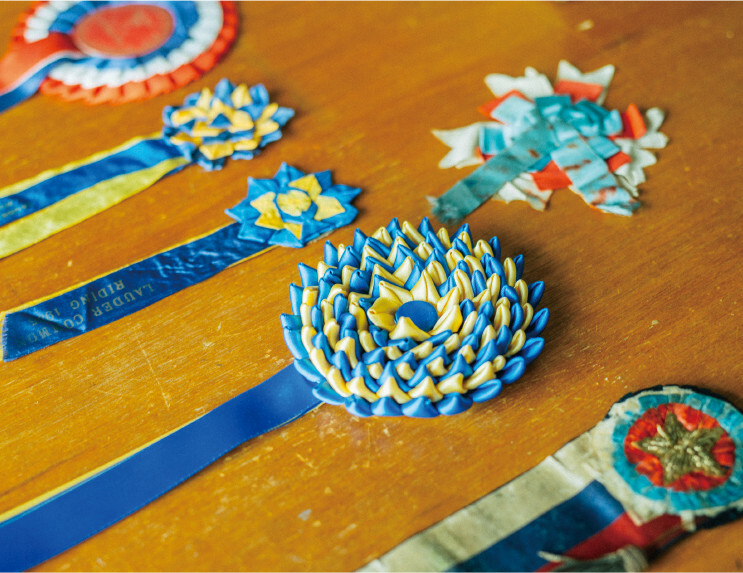 It was around then that I made a rosette for the first time – for one of his trophies. – Why give trophies as a birthday present? I wanted to give gifts to friends of mine who were stylists or cameramen, people who work really hard and seem to have knowledge on a wide variety of subjects, so it was always hard to come up with good ideas. One day, I saw a basketball trophy at a sporting goods store. The friend I was shopping for loved basketball, so I gave it to him and he was so delighted. It started there, and soon I realized I was gifting trophies every time there was a friend's birthday. Trophies imply victory and celebration, and their decorative design align with my postmodern influences from the 80's, too, so that made them appealing. – So you started with normal trophies? That's right. But I soon became unsatisfied with simply gifting trophies that I found, so I went to thrift stores and started buying them up where I could. I'd take pieces from different trophies and combine them into one. But the parts lacked variety and I soon lost interest in that as well. So I looked for useful shapes at molding plants, combined them and painted them white. I wanted to take the inherent meaning of trophies and bring it back to a neutral state. – I see. How did you discover rosettes? I looked for ribbons to put on these white trophies for a long time, but shops in town only had those that went with rosy decorations. 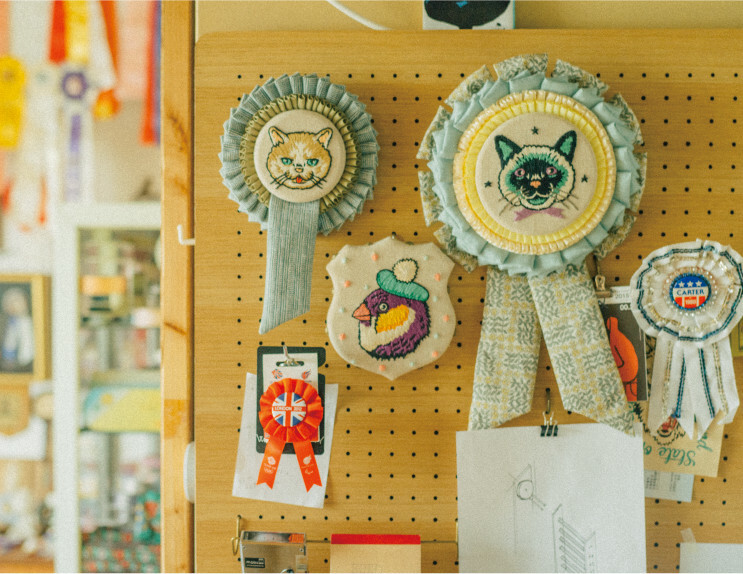 Then we found a ribbon at an emblem shop overseas that made us say, “This is it!” We soon learned that there are all shapes and sizes in the family of rosettes that you don't see in Japan. We reached out to merchants in England and America, but small businesses like ours were unable to do business with them. We finally started making them ourselves by hand. – Impressive. How did they turn out? Actually, we bought some ribbon and Mizuho sewed one together more easily than we expected (laughing). We showed it to a stylist friend and she thought it was cute, which was encouraging, too. For a while we displayed our rosettes in our friends' exhibitions and things, but in 2010 when we started preparations for our own exhibition, everything came to a grinding halt. We didn't feel like we could sell our rosettes just as they were. – And why is that? This might be part of the nature of being writer, but I thought we had to know the ins and outs of trophies and rosettes better than anyone else to make something original. We needed to know the history of how these objects came about, not just copying the design or technique that was once used to make them in the past. What would our rosettes look like then? I thought that could be the key to imbuing our emotion into our work. There's no information online if you search “rosette” in Japanese and we didn't find books or records of rosettes overseas, either. We felt our only remaining option was to go see the real thing for ourselves, no matter where that might be. – I see. So that's how your journey around the world searching for rosettes began. *The Takazawa's are authors of the book, Rosette ~The Great Search for Ribbon Medals~. They traveled far and wide when they heard any new information about rosettes. On their travels they saw a livestock fair in an English suburb, they visited fans of the English royal family, horse races in Scotland, a fair in Moravia, Czech Republic, bull fighting in southern France, dog shows in America, even local elections in India! Not only did they deepen their understanding of the various uses of rosettes, they learned where they came from and how they changed form as history progressed. 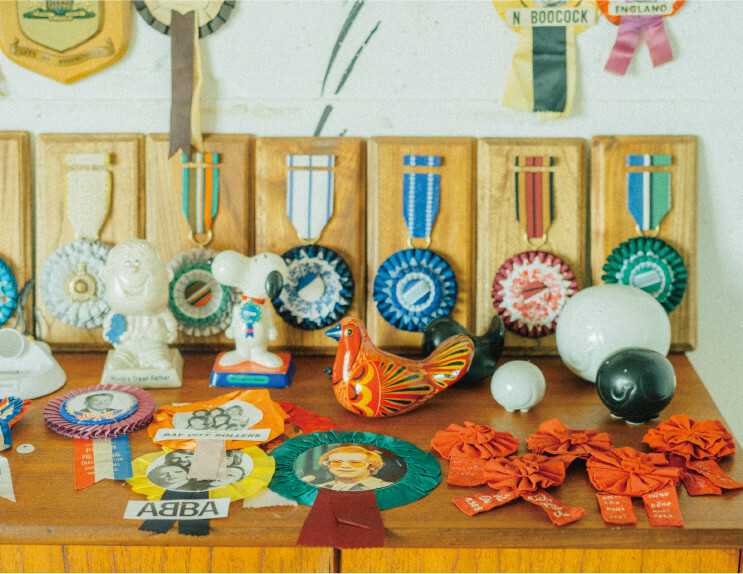 – How did this journey influence the way WHYTROPHY thinks about rosettes? Every time we travel overseas for research, we discover a rosette cherished by someone. 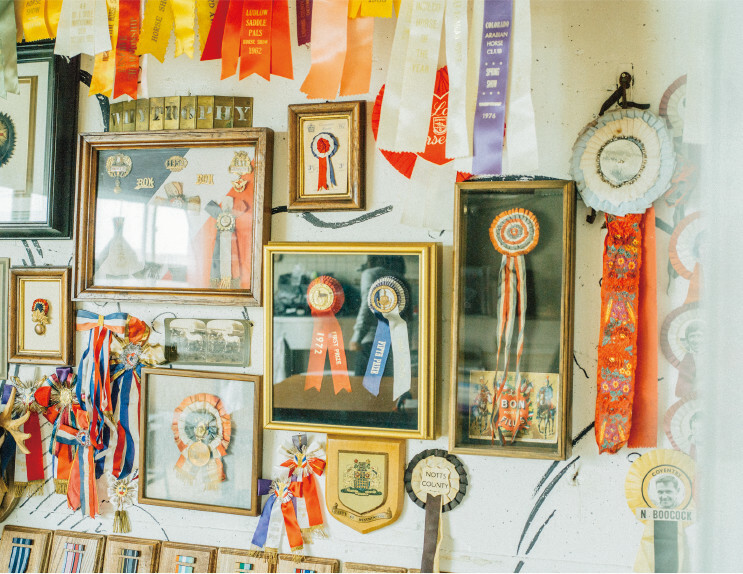 For example, we've spoken to people who hold dearly a rosette won by a dog or horse that died years ago and we saw signs of mourning stored in museum warehouses. As we continued having experiences like that, we felt like we should make something that will last a long time. 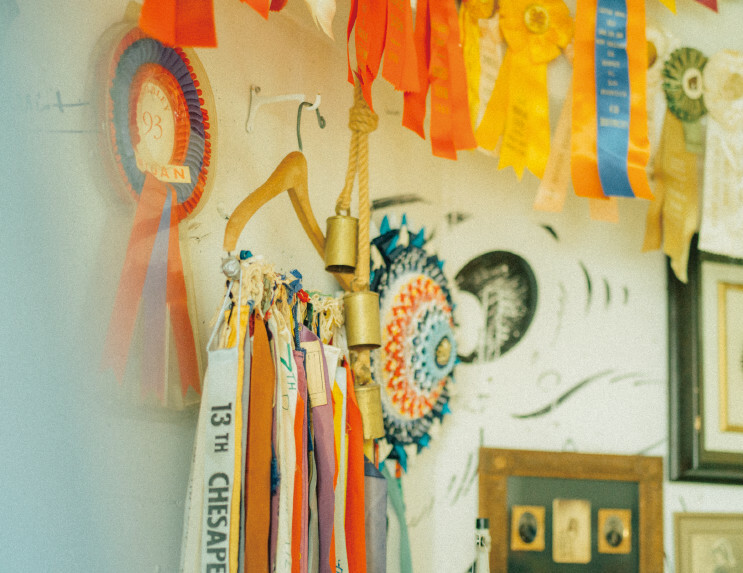 We wanted to make rosettes that could sit next to these cherished memories and stand on their own. Our mission is to speak words of our own and continue making these rosettes. It's important to us to recognize all aspects of the object we're creating and to pass that on. Rosettes had many uses. They were identifiers that determined friend of foe, a symbol of patriotism, or were used in ceremonies like coronations. They were even a fashion icon at times. They have many meanings, but we as WHYTROPHY want to stand on top of that foundation, which is their long history that shaped these various uses. 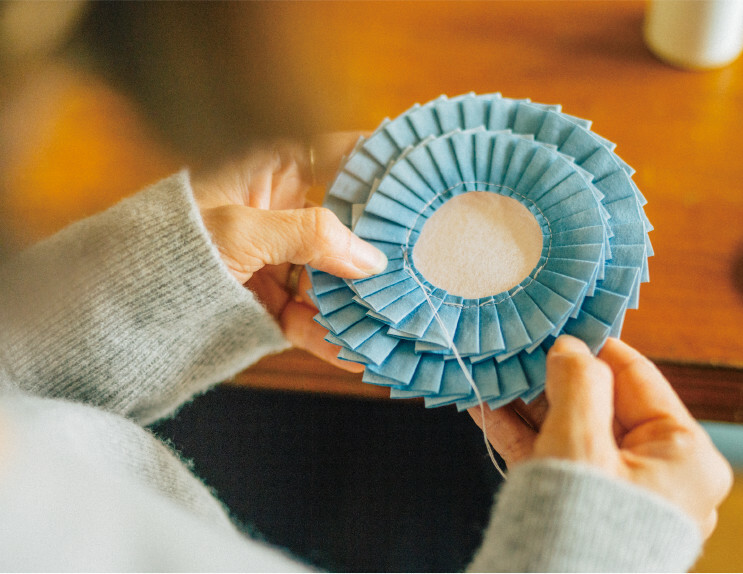 That's why we want rosette makers to teach us their process, and if there are iterations no longer being made, we want to get as close as we can to see their detail. We believe that if we can learn everything that has come before us by doing these things and from that base of knowledge make something completely new, our own originality will emerge. – Finally, please tell me what WHYTROPHY values most as a unit. 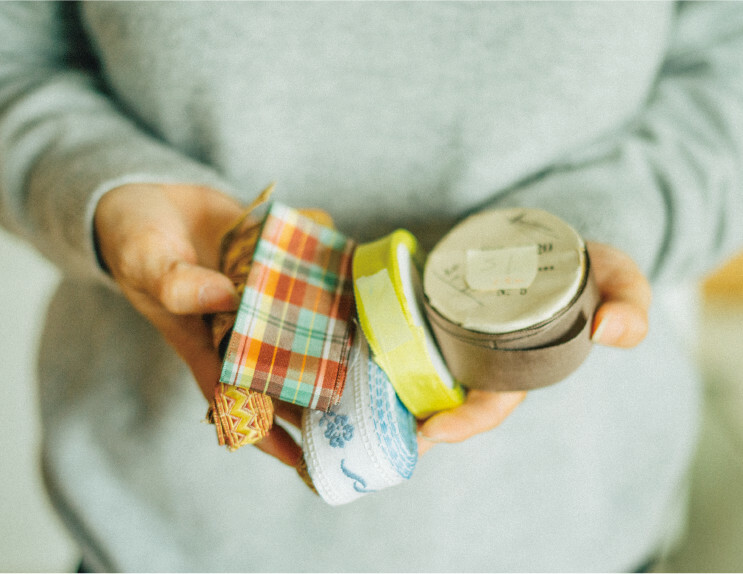 One of the reasons we started making rosettes was to use domestically produced high-quality ribbons to make products we can be proud of distributing around the globe. 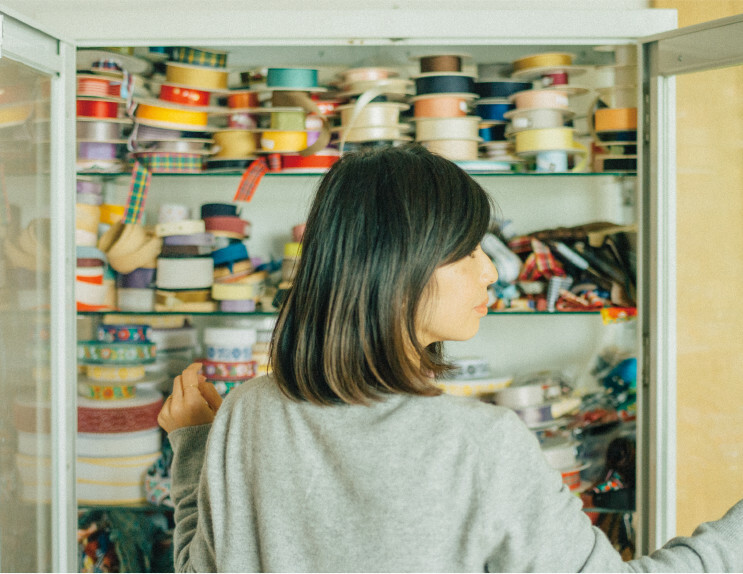 Fukui City, Fukui Prefecture is historically known for narrow-width textile production and the ribbons produced there are high quality and come in diverse varieties. These ribbons open up our range of expression and are crucial to our process. Another stylistic choice of ours is to use a covered button made of cotton at the center. We've searched for rosettes all over the world and think this design is absolutely unique. 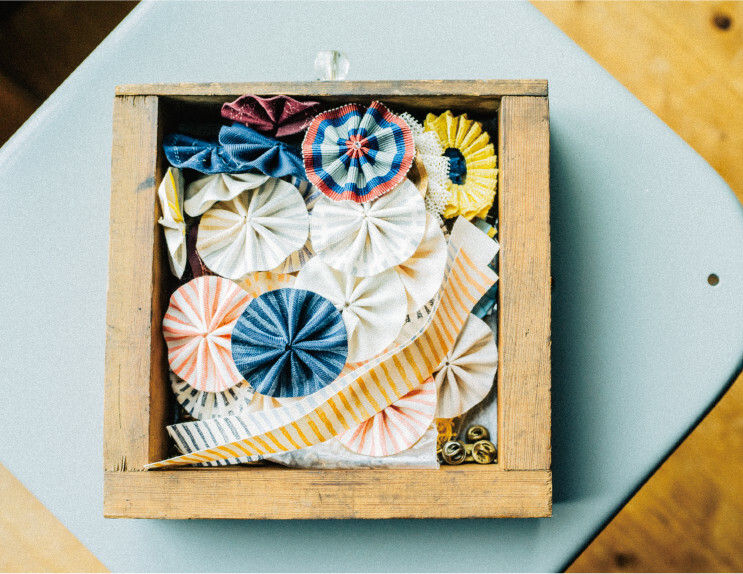 When we look at the oldest rosettes from around the world and the old customs or uses at their core, we start to think of them not as being ‘made’ but being ‘born’. It starts with a person who likes rosettes, there's a person who gives it and a person who receives it, and it's cherished for a very long time. That's the scene we want to become part of. A creative unit formed by Keisuke and Mizuho Takazawa in 2005. 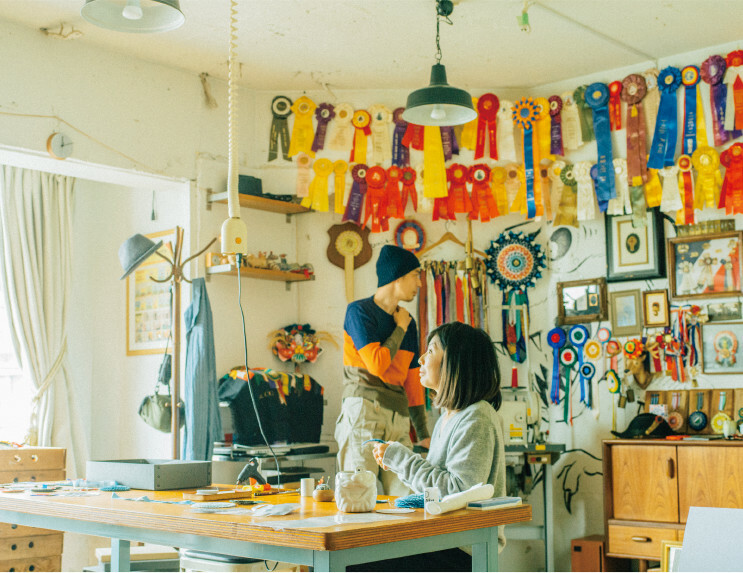 The duo researched various forms of &lsqou;praise’ through trophies and rosettes by visiting people around the globe to masticate the meaning and origins of such items in order to create their own original products. 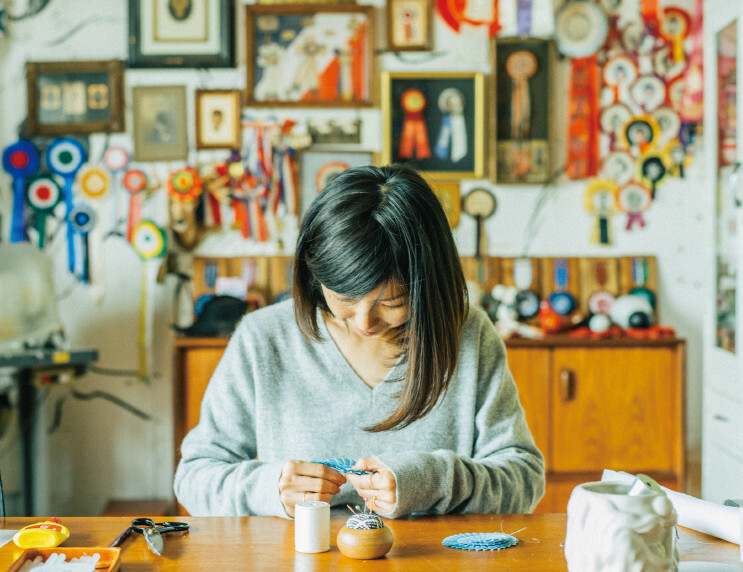 They display and sell their products and hold many rosette making workshops in Japan. 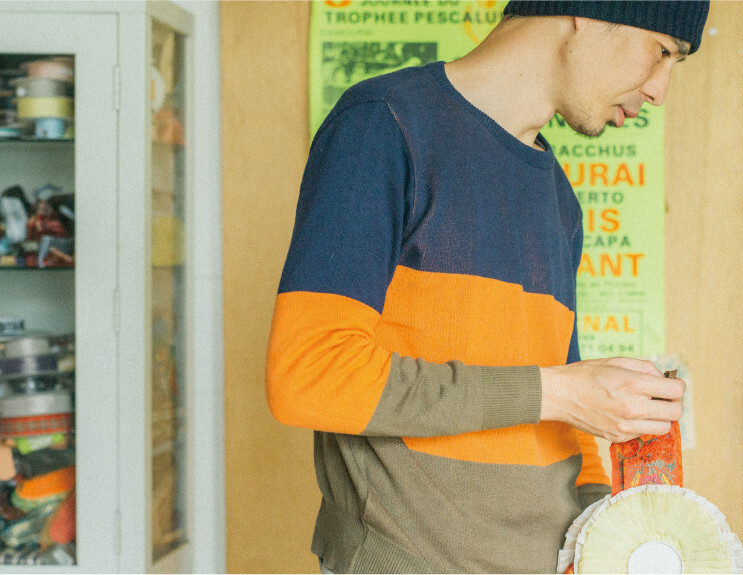 Recently they have announced collaborations with many brands in and outside of Japan. ©2016 MATURE Co.,Ltd. All rights reserved.